Ongoing activities at a biological field station located in upper Carmel Valley, Monterey County, California. Hastings is part of UC Berkeley's Natural History Museum's Field Stations, and a part of the UC Natural Reserve System. Hastings is administered by the Museum of Vertebrate Zoology, UC Berkeley. Hunt for Winddecker Cabin of 1870s. In Linsdale's history of Hastings, he mentions that "IIn Reservation records the largest hill within the boundaries is designated Poison Oak Hill. For a time it was known as Winddecker Hill because a man by that name lived there from about 1872 to 1878." We actually never knew where Winddecker's cabin was located. Yesterday I was scanning some old maps drawn by Dr. Keith White who studied the vegetation, particularly the blue oaks here on Hastings. 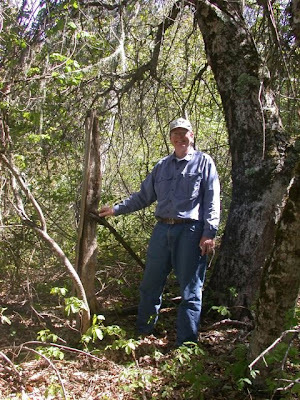 One of his oak study sites was on Poison Oak Hill and the map indicated the "ruins of Winddecker cabin", the associated nearby spring, and the "Old Red Tank". The spring was evidently developed by Winddecker so he could live there. Later this spring and Cement Spring were developed and used to keep stock tanks filled for cattle or sheep grazing Poison Oak/Winddecker Hill. All three of these features were on a map made in 1962. I called Keith today and he recalls that Jimmy Bell told him about the old ruin back in the 1960s and that is how it came to be on the map of oak study sites. Walt and I hiked up there today, and using Keith's map, we found all three. Click here for a slide show of what we found. Not much is left of the cabin- just one post, with a very thin plank nailed to it, and one hand-hewn floor joist. Poison oak is thick around the site, and indeed the hill is well-named.